pick up dropped loop and pull through first dc. Row 3 - Join in color 3 with a sl st to any ch1 space, ch3, work 1dc in same space, 2dc in each of next 2, ch1 spaces, * (3dc, ch1, 3dc) in next ch1 space, 2dc in each of next 3, ch1 spaces, * rpt from * to * twice, rpt between ( ) in next ch1 space, sl st to top of ch3 on beginning of row. Row 4 - Join in color 2 with a sl st to top of ch3, ch1, 1sc in base of ch1, 1sc in each dc around four sides of square, working (1sc, ch2, 1sc) in corners. Starting with ch1, 1sc into base of ch1, work 1sc into each sc around four sides of square, working (1sc, ch2, 1sc) into corners. Fasten off. Finishing - Weave in ends and trim. 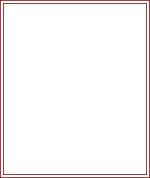 Can be used for blankets, waistcoats, poncho's etc. make as many as you need for your project. 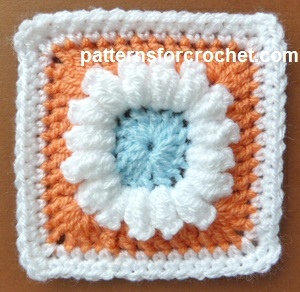 Hope you enjoy this free crochet pattern for granny square.